The Cathedral of San Sebastian in Lipa in the early 1900s. Image credit: The Luther Parker Collection at the NLP Digital Collections. Because important historical documents in the possession of the National Library of the Philippines were destroyed during World War II, in 1951 President Elpidio Quirno issued Executive Order #486 instructing Department of Education schools around the country to reconstruct the nation’s history down to the level of the barrio. All Department of Education superintendents were directed to have these reconstructions submitted no later than July 1953. These local histories have been digitized and are available at the National Library of the Philippines Digital Collections. They are a rich source of historical information, much of which cannot even be found in books. This article is a compilation of some of the historical trivia about towns of Batangas, most of which are likely unknown by the recent generations. In 1945, eleven barrios of Lemery filed a formal petition with Lemery’s municipal government asking to become a separate town. The petition was endorsed to the national government and by virtue of Executive Order #140 issued by President Elpidio Quirino, the eleven barrios became the new town of Pansipit. The order was revoked upon the request of the government of Lemery. However, after a plebiscite conducted to determine the true sentiments of the barrios’ inhabitants, Executive Order #212 was issued in 1949 granting the barrios town status, but with the name Agoncillo after Don Felip Agoncillo, regarded in history as the first Filipino diplomat. Poblacion Agoncillo. Image credit: Google Street View. 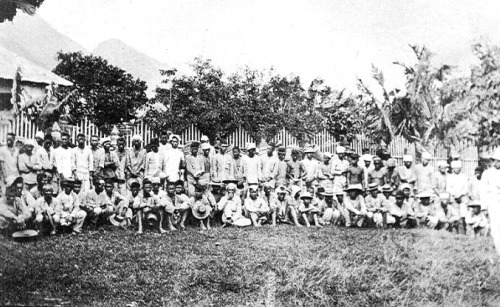 Filipino prisoners during the Fil-American War. Image credit: U.S. National Archives; University of Wisconsin Digital Collections. A church to the northeastern side of the town of Balayan was built during the Spanish colonial era completely on unpaid or forced labor. The poor among the people who could not pay their taxes or “tributes” to the Spanish colonial government needed to work for fifteen days every year without pay. This unpaid labor or “labor tax” enabled them to settle their obligations towards the colonial government. An old church in Balayan. Image credit: the Luther Parker Collection, NLP Digital Collections. Armed men led by a General Francisco Medrano attacked the Batangas Electric and Water Plant, the Batangas Police Station, the constabulary headquarters and a hospital in protest against the Liberal Party’s Elpidio Quirino’s allegedly fraudulent win over the Nationalista Party’s Dr. Jose P. Laurel. The armed men fled only after reinforcements for the army and constabulary arrived from neighboring towns. The uprising went on for a few weeks and did not end until December of the same year when Medrano accepted the surrender terms offered by the President-elect. Pre-war railroad track in Batangas Town. Image credit: Terrain Study No. 95, Batangas-Lucena,” Allied Geographical Section, Southwest Pacific Area. Citizens of the town of Bauan were rounded up by American troops in 1901 and forced to live within the boundaries of a re-concentration camp set up right in the poblacion or town center. This was part of General J. Franklin Bell’s strategy of preventing the civilian population of Batangas from supporting General Miguel Malvar’s “insurgent” troops. Although the Americans claimed that conditions in these camps were “humane,” the fact that people lived in close proximity and sanitary conditions were poor was conjectured by some historians as the reason why epidemics soon broke out. Actual picture of citizens of Bauan after round-up. Image loaded directly from Arnaldo Dumindin's "Philippine-American War, 1899-1902." Cotton was planted in Calaca and other towns of Batangas in WWII. Image credit: Hotel Room Search. The Spanish overseer of a plantation in Calatagan in 1805 treated his laborers cruelly and cut into their wages for his own benefit. He would beat workers and make them stay under the sun the whole day. One day, the peasants had enough, took up arms and, under the leadership of one Pedro de la Cruz, “killed the overseer on the spot.” The guardia civil had to be called in to quell the uprising, which went on until the peasants, fighting with no more than bamboo spears and branches of trees, were subdued and thrown into prison. Villagers plowing a field in Batangas. Image credit: Sandra Plummer Collection at the Fort Worth Library's Digital Archive. 7 December 1941 was, of course, a dark day in World History as Japanese forces attacked Pearl Harbor in Hawaii to ignite the war in the Western Pacific. Just eight hours later and the Philippine Islands were also attacked. In anticipation of a Japanese invasion, the seat of government was transferred from Batangas Town and provincial officials were evacuated to the town of Ibaan. The following month, however, Japanese forces had taken over Ibaan to put an end to the town’s brief term as the province’s capital. The town of Lemery used to be a barrio of Taal called Punta. The barrio and grew and subsequently became a town in itself with the name San Geronimo, not after the saint, but after its much beloved former parish priest whose name was Sancho Geronimo. The “San” was either the priest’s nickname or, as some historians suspected, a writing error committed by a Spanish chronicler. The name Lemery was after another beloved figure of the town, one Capitan Roberto Lemery who headed a military outpost in the town. The town of Lemery as seen from the air in 1935. Image credit: Terrain Study No. 95, Batangas-Lucena,” Allied Geographical Section, Southwest Pacific Area. During the Philippine Commonwealth, President Manuel L. Quezon visited the town of Lian to see for himself the social unrest sweltering there. The root of the unrest could be traced back to the Spanish era. Friars of the Colegio de San Jose seized Lian, claimed legal ownership and turned it into an hacienda. The town’s inhabitants were subjected to high taxes based on ecclesiastical law. This caused unrest which spilled over to the American colonial era all the way to the Commonwealth era. For a time, Quezon imposed martial law in the town until friction between the town’s citizens and the representatives of the Colegio de San Jose died down. President Manuel L. Quezon imposed martial law in Lian during the Commonwealth era. Image credit: Ang Pangulo Ko.